8-channel universal MIDI control surface compatible with all major DAWs. The Icon Pro Audio QCon Pro G2 is an 8-channel universal control surface with Mackie Control and HUI emulation to support most major DAWs. Whether you are tracking or mixing, the QCon Pro G2 provides intuitive tactile control over your session. Set your levels, fine tune your EQs and effects, record automation, punch in and punch out of recordings, all at the tip of your fingers. 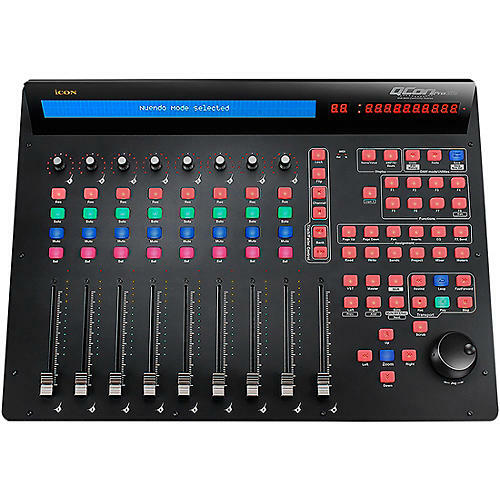 The QCon Pro G2 sports nine motorized faders, eight multi-purpose push encoders, 78 buttons, jog shuttle wheel, and 2-foot pedal connectors. 12-segment LED level meters are provided for each channel, and a large backlit LCD screen displays channel names and parameter values. A 12-segment LED display is also provided for SMPTE or MIDI beat clock. The Icon Pro Audio QCon Pro G2 utilizes Mackie Control and HUI emulation to control your favorite digital audio workstation and includes overlays for most popular DAWs including Cubase/Nuendo, Logic Pro, Ableton Live, ProTools, Studio One, Digital Performer, FL Studio, Samplitude, Reaper, Bitwig, Reason, Sonar, and Audition. A User Defined mode is also included to create custom presets and MIDI mapping. Seize control of your productions with the QCon Pro system.